We are pleased to announce two exciting new Relief Rides scheduled for January and February of 2010. 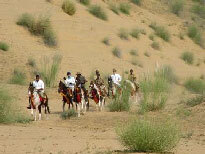 These rides explore new areas of Rajasthan and offer a new Relief Program. 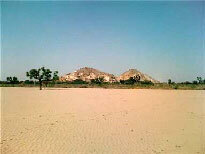 Our unique rides will take us through untraveled mystical parts of Southern Rajasthan. This culturally vibrant region is located in Pali district (3 hours from Udaipur). The region is known for its electrifying landscapes, exotic wildlife and wandering Sadhus (yogis) whom in ancient times roamed the desert in search of sacred ground for the magnificent temples that now grace this beautiful part of The Thar Desert. We'll ride our Marwari horses through a vibrant moonscape desert alongside the breathtaking Aravelli mountain range to several villages providing healthcare, educational materials and livestock to the semi-nomadic Rebari tribes and rural communities. After eight Relief Rides, we know that the magic of our trips lies in the power of a small group of people coming together with a shared intention to affect positive change for those in need. Each of our Relief Rides is unique, very little is scripted and the experience evolves as each person engages in the mission as a whole. We invite you to view a beautiful slideshow that captures the essence and passion of our Relief Ride experience. The last four years saw the creation of five powerful programs allowing us the opportunity to address blindness, general and pediatric medical care, famine and education for over 15,000 villagers of which 7800 were children. Please click here for more information on RRI's Relief Campaign. Poor dental hygiene and tooth decay are the roots of a cyclical decline in health. We have developed a two-day program to address critical dental care needs for rural communities in Nimaaj and Bordi, Rajasthan. Like our other ground-breaking programs, our dental camps will be the first time most of these villager will have had access to any type of dental care. After four years of conducting innovative humanitarian expeditions on horseback, we were delighted to create a whole new humanitarian travel experience. 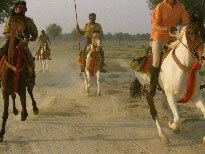 The RWI trip opens up our humanitarian experience to those not interested in participating on horseback. 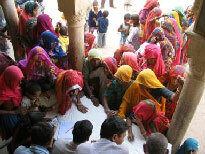 The expedition operates from a central location in The Rann of The Kutch, provides similar humanitarian programs, in addition to Yoga and an interactive seminar on the impacts of global warming and disaster management. 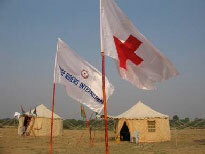 We successfully completed our inaugural Relief Workers International trip in January of 2009. Click here to view a beautiful slideshow of RWI's inaugural trip. This winter, RWI is offering a very special New Year's Trip in The Rann of The Kutch, Gujarat. Special New Year’s trip: December 22nd, 2009 - January 2nd, 2010. For our 2010 Relief Ride Season, we're limiting the number of riders per Relief Ride to 12. These rides have not been available since 2007. We are encouraging riders to reserve their spaces soon since the rides tend to fill up quickly. We're excited to have you join us in this effort and honored that our alumni riders and network of friends continue to support us in ways that allow our mission to flourish. 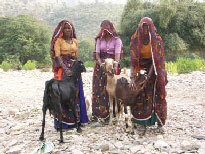 Livestock recipient from RRI’s Give a Goat programt.